Karl Chevrolet is pleased to present this 2017 Chevrolet Trax Premier AWD with only 13,727 miles. This super nice Chevy Trax Premier AWD was sold new and serviced right here at Karl Chevrolet so we know it has been well cared for. Great looking in Nightfall Gray Metallic with Light Ash Gray Leather Interior, features include Power Sunroof, Heated Seats, Driver Confidence Package I and II, Forward Collision Alert, Lane Departure Warning, Rearview Camera, Remote Start, Side Blind Zone Alert, Rear Park Assist, 18-inch Alloy Wheels and much more! This may just be the best overall value on our lot for twenty thousand dollars or less. This Chevrolet includes: SUNROOF, POWER, SLIDING Generic Sun/Moonroof Sun/Moonroof NIGHTFALL GRAY METALLIC SEATS, FRONT BUCKET WITH DRIVER POWER LUMBAR (STD) Driver Adjustable Lumbar Bucket Seats FORWARD COLLISION ALERT JET BLACK/LIGHT ASH GRAY, LEATHERETTE SEAT TRIM Premium Synthetic Seats DRIVER CONFIDENCE II PACKAGE Lane Departure Warning WHEELS, 18" Aluminum Wheels AUDIO SYSTEM, CHEVROLET MYLINK RADIO Smart Device Integration AM/FM Stereo Bluetooth Connection MP3 Player ENGINE, ECOTEC TURBO 1.4L VARIABLE VALVE TIMING DOHC 4-CYLINDER SEQUENTIAL MFI 4 Cylinder Engine Gasoline Fuel Turbocharged LPO, ROOF RACK CROSS RAILS, SET OF 2 Luggage Rack AXLE, 3.53 FINAL DRIVE RATIO PREMIER PREFERRED EQUIPMENT GROUP TRANSMISSION, 6-SPEED AUTOMATIC (STD) A/T 6-Speed A/T LANE DEPARTURE WARNING Lane Departure Warning EMISSIONS, CONNECTICUT, DELAWARE, MAINE, MARYLAND, MASSACHUSETTS, NEW JERSEY, NEW YORK, OREGON, PENNSYLVANIA, RHODE ISLAND, VERMONT AND WASHINGTON STATE REQUIREMENTS *Note - For third party subscriptions or services, please contact the dealer for more information. * When you purchase a vehicle with the CARFAX Buyback Guarantee, you're getting what you paid for. CARFAX shows that this is a one-owner vehicle -- no wonder it's in such great condition. Why own a car when you can own a lifestyle? We at Karl Chevrolet offer you nothing less than the best with our Certified Pre-Owned vehicles. This vehicle meets Chevrolet's highest level of standards, allowing us to provide you with what you deserve. With this exceptional SUV, you'll get "sport," "utility," and comfort. The Chevrolet Trax Premier is economically and environmentally smart. Chevrolet clearly delivers on its promise to provide a fuel-efficient vehicle that has the great qualities you need in a vehicle. This AWD-equipped vehicle handles well in any weather condition or terrain. You'll benefit from superb handling, improved steering, and excellent acceleration. In addition to being well-cared for, this Chevrolet Trax has very low mileage making it a rare find. Rest assured, this vehicle was well cared for. In fact, previous service records are included. Added comfort with contemporary style is the leather interior to heighten the quality and craftsmanship for the Chevrolet Trax More information about the 2017 Chevrolet Trax: The Chevrolet Trax competes with other small SUVs such as the Toyota RAV4, the Honda CR-V and the Ford Escape. Setting the Trax apart from many of its competitors, are its turbocharged engine and its high levels of interior equipment, including a standard 7-inch color touch screen. With a base price of around $21,000, the Chevrolet Trax is an excellent addition to the small SUV segment. 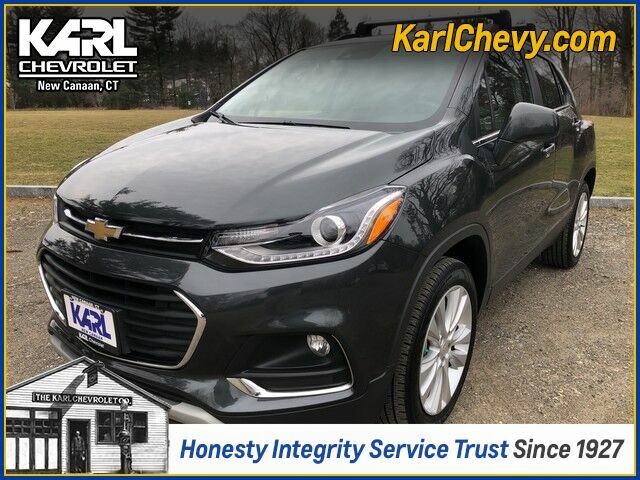 Interesting features of this model are versatile interior, available all-wheel drive, an elevated level of standard technology, Compact footprint, decent ground clearance, and fuel efficiency As always, our goal here at KARL Chevrolet is to assist you to find the perfect vehicle to meet your needs. While we strive to have the area's best selection of quality pre-owned vehicles in stock at all times, we know there are times when a customer may have very specific needs. If you have a specific model or features that you are searching for, please let us know. You might be surprised how quickly we can find a match! Just another KARL Advantage .... finding you the perfect vehicle at the best overall value. Thank you for the opportunity to assist in your vehicle search.